The luxury watch market has been soaring in the past few years and with interests payed by banks being so low investors are getting more and more attracted to my market. 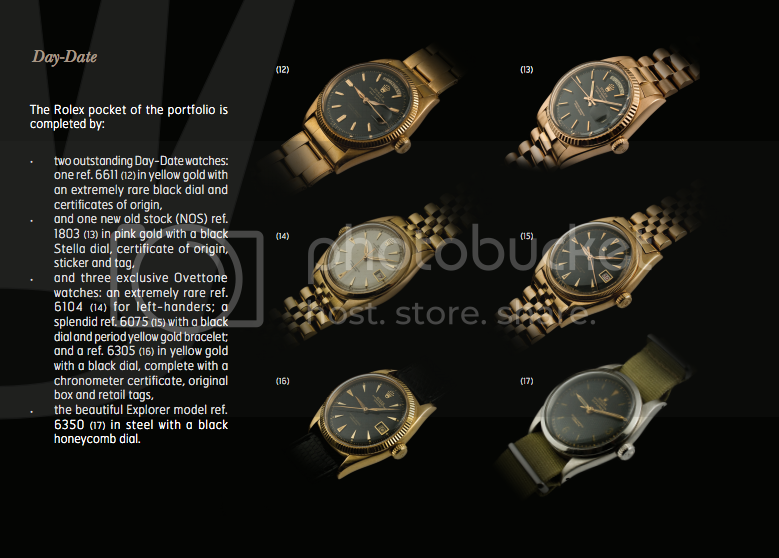 I completely understand my prospective buyer when buying a Patek Philippe or a Rolex as an investment. Not only you can enjoy it ,wear it and pass it on to your kids and grand kids but also it only appreciates in value. Unlike any other luxury accessory Rolex and Patek are just cash on the spot anywhere in the world. As Alfredo Paramico pulls up in a blue Audi at the 178-year-old neoclassical Four Seasons Hotel des Bergues in Geneva, the staff snaps into action. “Monsieur Paramico has arrived,” a doorman says into a microphone on his lapel, alerting colleagues inside the hotel. With his handsome chiseled face, crisp white shirt, jacket by Neapolitan bespoke tailor Biagio Mazzuoccolo and slim jeans, Paramico looks like an actor. Located in the heart of a city that’s home to Patek Philippe SA and Rolex Group, the hotel pampers Paramico because he’s one of the world’s leading watch collectors, Bloomberg Pursuits magazine reports in its Fall issue. These days, as everyone from Michael Schumacher to Usher to Arnold Schwarzeneggercollects mechanical watches worth tens of thousands of dollars, Paramico is in a league of his own. Now 43, the Italian banker from Milan started buying Swiss timepieces more than two decades ago, before Geneva auctions overflowed with buyers. He has devoted himself to an intensive study of rare vintage watches and put together a grouping of 10 exceptional Patek Philippe timepieces. His assemblage makes Paramico one of the top 10 collectors worldwide out of a total of about 50,000 enthusiasts, says Davide Parmegiani, a dealer in Lugano, Switzerland, who has sold luxury watches for 25 years. Or the best of Patek Philippe, a company founded in 1851 whose handcrafted parts and sophisticated mechanical movements set it apart from many of its Swiss rivals. Several of Paramico’s vintage pieces date back to the 1940s and ’50s, and all of his watches are encased in either white gold, platinum or steel — rather than the more common yellow gold — giving them the name white Pateks. Six of them contain so-called complications that make the watches distinctive, such as a perpetual calendar that automatically adjusts to the start of a new month. Paramico says his collection is worth about 20 million euros ($25 million), or about 8 million euros more than what he paid for the watches starting in 2000. Paramico is now off on a new quest to show investors that watches can earn solid returns. In 2010, Luxembourg-based Elite Advisers SA, a firm that manages wine and jewelry investment funds, asked Paramico to start the world’s only regulated open- ended watch fund. He already had a day job as head of global markets at the Italian branch of Spain’s Banco Bilbao Vizcaya Argentaria SA (BBVA), where his team in Milan buys and sells equity, debt and foreign- exchange assets. But Paramico couldn’t resist the offer and almost immediately said yes. So, after arriving home each night from the bank, he typically retreats to his study in his spacious 19th-century apartment in Milan’s chic Brera district to manage his watch fund. The study highlights his singular obsession. Its shelves are packed with more than 500 auction catalogs and about 1,000 other watch publications. His yellowing archival material contains minute production details of classic pieces. Paramico says he scours the catalogs and speaks to collectors and dealers often until 1 a.m. in search of his next prized timepiece. Paramico says investors seeking gains from hard assets are moving into his fund partly because the vintage watch market is not correlated with the movement of securities. At the end of August, his 19.5 million euro fund held 512 luxury timepieces — mostly Patek and Rolex. He says the fund could eventually swell to 250 million euros. It notched an 18.2 percent gain from inception at the beginning of 2011 through August 2012, beating the 11.8 percent rise in the Standard & Poor’s 500 Index (SPX). To avoid conflicts, securities regulators in Luxembourg prevent any of his watches from coming into the fund. On a May morning in Geneva, Paramico shows a group of about 10 Swiss men and women the watches he has purchased for his fund. The pieces are mostly vintage and kept in an underground vault behind a series of security doors at the free port, a tax- free storage area. As the investors examine the watches, Paramico, who also speaks French and English, tells them that rare, high-quality pieces will continue to appreciate because of the limited supply and growing demand, particularly from Asia. Prices of a particular type of Rolex Cosmograph Daytona, which gained fame partly because the late actor Paul Newman owned one, climbed to $105,000 last year at a Christie’s auction from about $33,000 in 2002. Paramico’s fund owns several Paul Newman models. When Paramico first started going to auctions in Geneva run by Christie’s, Sotheby’s andAntiquorum in the 1990s, demand for watches was scant. There were a lot of empty seats, and a few buyers could have bought most of the catalog between them. Now, collectors compete for seats at standing-room-only auctions, with bids by phone coming in from all over the world. During a packed Christie’s auction at the Hotel des Bergues in May, Paramico eyes a rare vintage Rolex for his fund. The yellow-gold piece has a slightly rounded case back, a black- lacquer dial and star-shaped indices. The one shortcoming: It lacks a mechanical complication such as a chronometer or stopwatch function. Bids in at least eight different currencies come in by phone and are displayed digitally on a wall covered in blue fabric behind the auctioneer. Paramico, seated near the back of the chandelier-lit room to better scope out his competition, waits patiently before making his move for the Rolex, now at 260,000 Swiss francs ($270,000). “New bidder, blue shirt, 265!” declares the auctioneer as he points to Paramico. He and a rival get into a bidding war. The Italian banker raises his offer several times by 5,000 francs before shaking his head to withdraw, refusing to top 300,000 francs, the winning bid that’s twice Christie’s high estimate. Paramico says he calibrates values based on quality, age, uniqueness and complications and is careful not to overpay, particularly when buying for his fund. “When we reach 300,000 for a time-only Rolex, even if very rare and very particular, we need to say stop,” he says. The son of an engineer, Paramico recalls first becoming fascinated with watches as a young child in Naples, Italy. A family photo shows him as a 6-year-old coveting his mother’s Zenith. Small yet weighty objects appealed to him, and to this day, he often carries a watch in his pocket because of the sense of security it gives him. As a teenager, he began buying inexpensive timepieces, partly with money he earned making deliveries for a pastry shop. He graduated from Bocconi University in Milan with a master’s degree in econometrics and took a job trading options on government bonds at Bankers Trust (BNKR) in London in 1994. Armed with a bigger salary, he began plunking down $200,000 on high- end pieces. Seeking even higher quality, he honed in on Pateks, buying one in 1999 with a pink-gold case, calendar, chronograph and function showing moon phases. He paid the equivalent of 225,000 euros and sold it a few years later for 450,000 euros after deciding to refine his collection to just white Pateks. “White is considered more chic, and there’s nothing more exclusive than white Pateks,” Parmegiani, the dealer, says. Paramico has spent more than 1 million euros for several of the watches in his personal collection. He estimates he has devoted about 90 percent of his career earnings to his watches, with enough left over for his 2009 599 GTB Ferrari and paintings by Italian postmodernists such as Mario Schifano. His strategy helps reduce the risks of investing in an opaque market where timepieces are often privately exchanged and values are based mostly on a collector’s taste rather than hard data. Paramico says watches from newer brands often lose up to 40 percent of their retail value when they sell at auction. Paramico, who gathers pricing data from auctions and other collectors, made the biggest watch purchase of his life in 2007. Four years earlier, he began his pursuit of the first of only four known steel Pateks, reference number 1518, that feature a perpetual calendar and chronograph. Paramico knew the owner –the world of elite watch collectors is small — and contacted him. But the owner, an Italian in thetextile industry, didn’t want to sell the Patek. Paramico persisted, often meeting him for dinner during auction weekends in Geneva and in Italy. In 2007, at Hotel des Bergues, the owner told Paramico he was selling his vintage watches to focus on contemporary models. Paramico could have the steel Patek for 2.2 million euros, almost five times what the owner had paid in the early 1990s. The banker said yes on the spot.